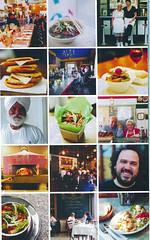 Well, our most recent food magazines (Food & Wine, Gourmet, etc.) have us worked up into a frenzy over grilling--hell, Gourmet's even got us thinking about building our own backyard oven/BBQ pit even if "Grandpa" (our beloved landlord, Arthur) would never, ever let us. But, frankly, it's been a bit wet in these here parts in recent weeks and the grill hasn't gotten nearly as much action as we would have liked. One piece of equipment that has been seeing some action, however, is our DVD player, and one of the reasons for this is that we started watching The French Chef with Julia Child on DVD over the last little while. After all, BBQing may be getting washed out at the moment, but lobster season just got underway and we had to bone up (hence the photos above and below). Not only were we already big fans of Mastering the Art of French Cooking, vols. 1 & 2 and The French Chef Cookbook, we were true believers (see our post on Coq au Vin, for instance), but I'd forgotten what an experience it was to watch The French Chef and Michelle had never seen the show at all. 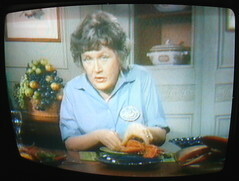 We're not the hugest watchers of food TV (we don't have cable), but we certainly enjoy the occasional food show on DVD. Revisiting The French Chef, however, was something altogether different: part food show, part history lesson, part seminar in television aesthetics, part character study. Aside from all of the touches that mark the show as "dated"--the hues of the studio kitchen, the electric stovetop, the low-tech gadgetry ("kitchen shears!") --what makes the show truly fascinating is the utter lack of editing, the fact that most of the cuts in the episode amount to no more than a simple switch from one studio TV camera to another. Of course, you see this to a certain extent in contemporary food programming, too, but for the most part it's combined with a big-budget obsession with getting every last touch "just so" and a studied sense of telegenics, so you never really get the feeling that this is one long continuous take the way you often do with The French Chef. 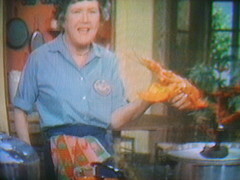 Aside from giving the show a look and feel that comes across as "primitive" (read: low-budget, meandering, idiosyncratic), it allows you, the viewer, to see Julia Child open up in a way that you would never see today. The tics, the malapropisms, the digressions, the moments where she gets tongue-tied (in her episode on how to stuff sausages she got tripped up on the ratio between fatty meat and lean meat for what seemed like 5 minutes), and, above all, those looks, those knowing looks with those smiles of hers, create a fascinating effect. Simultaneously, you're reminded of the circumstances of the production at every turn and utterly enchanted by the experience. In other words, the aura of conventional television is punctured over and over again, but it's immediately replaced by another form of aura. We learn a lot from each episode, even if we're familiar with the terrain ahead of time, but more importantly we're fascinated, and we find ourselves turning to one another, speechless, over and over again as we watch. "Did you see that?" Our love affair with Julia has grown--in fact, Michelle is prone to saying, "I love her!" at least once during each episode. Somehow inviting her into our home has become paired with the illusion of having been invited over to an old friend's--an old friend with a crazy New England accent, that is--for dinner. The French Chef with Julia Child, vols. 1 & 2 ("As seen on public television"!) were released on DVD by WGBH-Boston in 2005. Highly recommended. 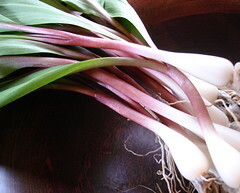 Ramps, or Wild Leeks, or, in French, Ail des Bois (Allium tricoccum), are something of a local tragedy. If you've been down to New York at this time of year at any time over the last 10 years you'll know that ramps became the darlings of the new American cuisine sometime in the mid-1990s, if not earlier. This phenomenon ran parallel with the discovery of fiddleheads on the part of American chefs. All of a sudden both ramps and fiddleheads were everywhere, in the city's small markets, like the Union Square Market, and in many of the city's finer restaurants, a sure sign of spring. Ramps have a singular taste, one well worth the hype, but there's no question that part of their appeal had to do with the fact that the season for them was so short--somehow this small window of opportunity made their delicate flavors all the sweeter. Well, the habitat for ramps ranges from northern Georgia all the way up into eastern Canada and the Maritimes, but they grow especially well around maple trees. 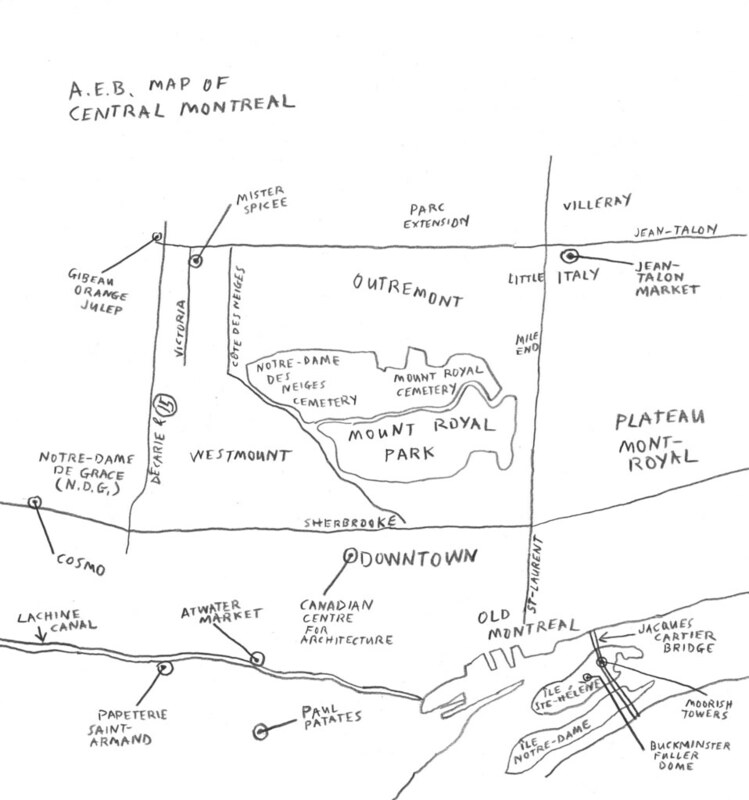 In other words, this is prime ramps territory. Search the local markets and most of the restaurants in town, however, and you won't find a ramp in sight. The reason? Well, the popularity of ramps in this region nearly brought about their demise--over-harvesting in the 1970s and 1980s placed them in endangered status and in 1995, just at the time that they rose to prominence south of the border, it became illegal to harvest ramps in anything but the smallest quantities. Some restaurants have reintroduced them onto their menus over the years (Les Chèvres has them on the menu with Quebec crayfish at the moment), but they've had to import them from other provinces or even New York and Vermont. Looking for your own? Well, you could just go for a walk in the woods pretty much anywhere in the region (again, anywhere you find maple trees), or you can make a short cross-border hop in search of them. Alternatively, you could place an order with a place like Cookstown Greens ((705) 458-9077) and have them shipped from Ontario. We've had a tradition of going down to New York to visit our friends and take advantage of "ramps season" for a number of years now. This year we weren't able to make the trip for the first time in a few years, but we were fortunate to find ourselves in possession of a bunch of twelve beautiful specimens from upstate New York. We didn't have many, and we weren't sure we'd get them again this season (we're talking about a 3-4 week season, tops), so we had to be judicious. We decided to have them for breakfast two days running. 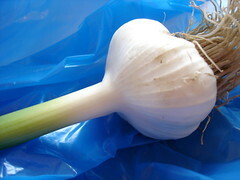 Day 1: Michelle found the first of the season's new garlic at Jean-Talon Market. Earlier in the week we'd bought a hunk of homemade saucisson à l'ail from a local charcuterie. 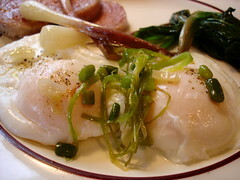 Between the ramps, the new garlic, and the saucisson we had four different forms of garlic (if you include the rather delicious garlic shoot that comes gratis when you buy new garlic), so we created our 4x garlic breakfast with poached eggs: ramps sauteed with new garlic and garlic shoots, served with pan-fried saucisson à l'ail. 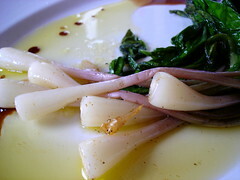 This morning we were going to grill our remaining 6 ramps, but our gas canister conked out on us when we lit the fire, so I sauteed the ramps with new garlic and a bit of olive oil, then tossed them with a balsamic vinaigrette with Maldon salt. More poached eggs, a couple slices of bacon, and a bagel with cream cheese completed the scene. Ramps: get 'em if/while you can. I can't think of a better excuse for a walk in the woods. But, then again, I'm a bit biased. Things got started on a Wednesday. That was the day my birthday gift from my sister showed up on our doorstep. I cracked open the package and found my very own copy of Anya von Bremzen's critically acclaimed The New Spanish Table. Karina had received a copy herself as a birthday gift late last year and she'd been raving ever since. She even brought it with her when she came to visit for Christmas, but our minds were on other matters and we never got around to testing it out. had made it home safe and sound, but somehow the recipe had gotten misplaced, so I'd never used them. I'd really been craving those wonderful stuffed peppers recently, so I finally gave up hope of finding the recipe in some overlooked corner of our apartment, bit the bullet, and admitted the loss to Esti, and I asked her to send me her family recipe once again. I still haven't received the Capetillo family recipe for Pimiento de Piquillo Rellenos de Carne--Esti's still in the thick of schoolwork--but when I opened up The New Spanish Table I was thrilled to see that Von Bremzen's book had a version. And that was just the beginning. It's safe to say The New Spanish Table is a page-turner, both seductive and informative, and what began as casual leafing soon turned into intent reading. The next thing I knew a couple of hours had been lost to Iberian reverie (if you thought Bohemian rhapsody was fun...). Von Bremzen's book is the comprehensive reassessment that Spanish cuisine has deserved for quite some time now. It's loaded with all kinds of mouth-watering recipes, but, as its title suggests, it's also a very good survey of the state of Spanish cuisine, of how it's breaking new ground while steadfastly holding onto tradition, exemplifying the dynamism of the new Europe while simultaneously taking the care to preserve and protect its heritage and its regional specificities. I can't say I'm crazy about the style of the book, which reminds me too much of a Spanish language textbook with its layout, its "festive" color scheme, and its uses of infoboxes, but it sure makes for a good read and it makes you want to hop a plane to Madrid, Barcelona, Vitoria-Gasteiz*, or any one of a number of other Spanish cities, immediately. In the middle of reading The New Spanish Table the phone rang. I put my book down, picked up the phone, and received an invitation to go to Tapeo for the first time. Absolutely perfect timing, a bit magical even. I'd been particularly taken by The New Spanish Table's extensive section on tapas, and if Von Bremzen's book has been something of an international hit on the cookbook scene over the last year, Tapeo has definitely been the hottest Spanish restaurant--tapas or otherwise--to open up on the local restaurant scene for years. 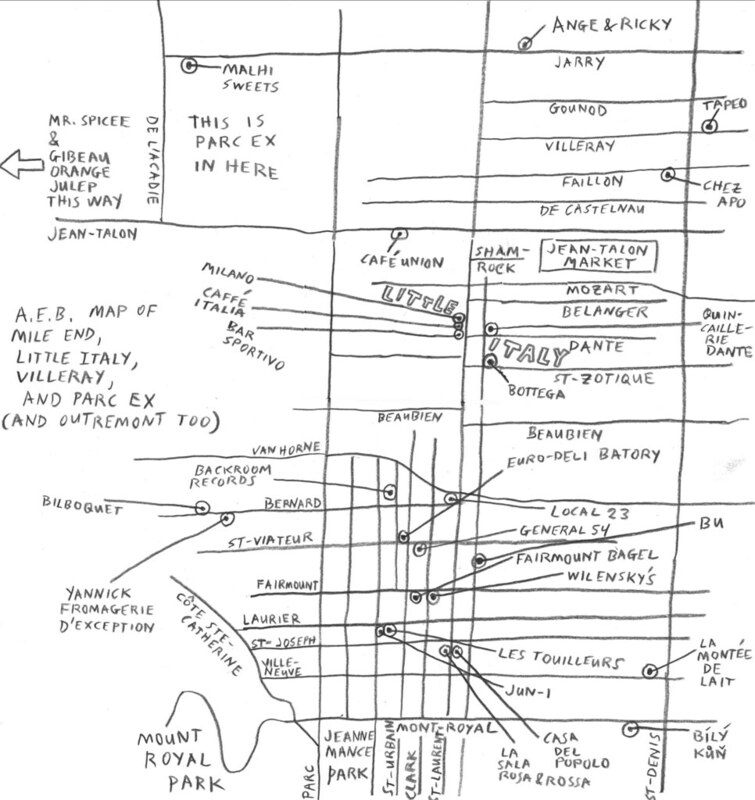 So hot, in fact, that it's actually changed the culinary landscape of Montreal, introducing a lot of people to the sorely overlooked Villeray district. Michelle had been to Tapeo for lunch a few weeks earlier, but I'd yet to have the pleasure. I was already keen to give Tapeo a close look, The New Spanish Table had me absolutely raring to go. Well, as good as some of the tapas in this town may be, we don't live "in a true tapas bar culture" here (I mean, whoever heard of making reservations at a true, rough-and-tumble tapas joint? ), but at least we could try and contribute to the overall tapas culture, right? The only thing to do was to take matters into our own hands. So we organized a little tapas-themed soirée for the following Sunday evening. Michelle and I were in the mood to have people over, we had Spanish food on the brain (obviously), and we were just dying to give our latest acquisition a true test--it was a natural. We did some reading, we debated and discussed logistics, and then we devised our menu: olives, jamón Serrano, marinated carrots, garlicky sauteed rapini, garbanzos con chorizo, asparagus with Romesco sauce, Pimiento de Piquillo Rellenos de Carne, lots of bread to sop up all those lovely sauces, a baby arugula salad to cleanse the palate, and last, but certainly not least, a Tarta de Narajas Valenciana. Place the carrots in a large pot of boiling salted water and cook until just tender (they should still have a bit of crispness to them), 8-10 minutes. Drain the carrots and let cool just enough to handle, then cut them into 1/4-inch rounds. While the carrots are cooking, place the garlic, cumin, oregano, red pepper flakes, 1 tablespoon parsley, salt, and 1 teaspoon olive oil in a mortar and, using a pestle, mash them into a medium-fine paste. Whisk the lemon juice into the garlic paste. Place the carrots in a glass bowl while they are still warm and pour the garlic paste over them. Add the vinegar and the remaining 1/2 cup olive oil and toss to mix. Cover the bowl with plastic wrap and let marinate for at least 6 hours or refrigerate overnight. The carrots can be refrigerated for at least a week. Let the carrots come to room temperature before serving, place in a serving bowl, and garnish with some more parsley. This recipe makes a light tapa for 8-10. Heat 2 tablespoons of the olive oil in a large skillet over medium-low heat. Add the onion and garlic and cook until completely softened but not browned, about 7 minutes. Add the veal, increase the heat to medium-high, and cook, mashing and breaking the meat up with a fork, until the veal is no longer pink, about 5 minutes. Add the tomato and cook, stirring, until the tomato is thickened and the pan juices are reduced, 5-7 minutes. Season the veal mixture with salt and black pepper to taste and set aside. Heat the remaining 2 tablespoons olive oil in a medium-size saucepan over medium-low heat. Add the 2 tablespoons flour and stir for about 30 seconds to blend. Slowly pour in the milk, whisking constantly. Increase the heat to medium-high and cook, stirring, until the béchamel sauce thickens, 3-5 minutes. Season the sauce with salt and pepper to taste, then stir it into the veal mixture until thoroughly combined. Set the filling aside until cool enough to handle. Stuff the Piquillo peppers with the veal mixture, taking great care not to spit the sides. If you use true Piquillo peppers this will be fairly easy because they stuff well; if you substitute another kind of pimiento you may find this harder to accomplish. They peppers should be quite full, but the filling should not be spilling out. Arrange the stuffed peppers on a plate, cover them loosely with plastic wrap, and refrigerate until the filling becomes firm, at least 2 hours or up to 24. Spread flour on a large plate, place the eggs in a shallow bowl, and line a baking sheet with paper towels. Pour the olive oil to a depth of 1/2 inch in a large skillet and heat it over medium-high heat until a little beaten egg sizzles on contact with the oil. Roll a few stuffed peppers in the flour, shaking off the excess, then dip them in the egg, again shaking off the excess. Add the battered peppers to the hot oil and cook until golden, about 2 minutes per side. Using a slotted spoon, transfer the fried peppers to the paper towels to drain. Repeat with the remaining stuffed peppers, adjusting the heat so that the oil doesn't burn. The peppers can be prepared a day ahead up to this point and refrigerated, if you like. Just keep them covered in the refrigerator. Heat the olive oil in a medium-sized skillet over medium-low heat. Add the onion and garlic and cook until softened but not browned, about 5 minutes. Add the chopped Piquillo peppers and the tomato and cook, stirring, until the tomato is thickened and reduced, about 7 minutes, reducing the heat if necessary. Add the sweet and hot paprikas, stir for a few seconds, then add the wine and the chicken stock. Cook the sauce to reduce it slightly, 3-5 minutes. Add the cream and cook until heated through, about 1 minute. Let the sauce cool for a few minutes, then puree it in a blender until smooth. Scrape the sauce into a bowl, stir in the vinegar to taste and the sugar, and season the sauce with salt and pepper to taste. If the sauce seems too thick, dilute with a little stock or water. Preheat the oven to 425˚F. 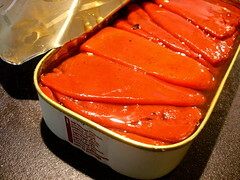 Spread half the tomato sauce in a baking dish that can hold the peppers in one snug layer. Arrange the peppers on top and spread the remaining sauce over them. Bake the peppers and sauce until they are very hot, about 15 minutes. Remove from the oven and let cool for about 5 minutes. Serve, garnished with parsley or chives. Serves 8 as a tapa, 4-6 as a light main course. Cut off and discard a thick slice from each end of the oranges. Using a sharp knife, cut the oranges into 1/8-inch-thick slices. Place the orange juice, sugar, grated orange zest, and orange flower water in a wide pot and bring to a simmer over medium-high heat, stirring until the sugar dissolves. Add the orange slices; if they are not submerged in liquid, add a little water. Reduce the heat to low and let the oranges simmer, partially covered, for 15 minutes. Let the oranges slices cool in the cooking liquid, then drain them and gently pat them dry with paper towels. Cut the orange slices in half. Position a rack in the center of the oven and preheat the oven to 375˚F. Spread the marmalade evenly in the bottom of the tart shell and arrange the halved orange slices on top in concentric circles, overlapping slightly. Bake it on the center rack until the oranges are very soft and lightly browned, 30 minutes. Preheat the broiler. When the tart is just cool enough to handle, wrap aluminum foil around the edge of the crust so that it doesn't burn when the tart is caramelized. Sprinkle sugar in a think, even layer over the tart and broil until the sugar is caramelized, 4-7 minutes, depending on the heat of the broiler, being very, very careful not to let the tart burn (you can achieve the same effect with a kitchen blowtorch, if you're lucky enough to have one). Let the tart cool to room temperature before serving. Place the flour, the sugar, and salt in a food processor and pulse 5 or 6 times, just to combine. Add the butter and pulse until the mixture resembles coarse meal. Place the disk of dough between two pieces of lightly floured parchment paper and roll it out to an 11-inch circle. Transfer the dough to a 9-inch tart pan with a removable bottom, press into the side of the pan, and trim the overhang. Freeze, covered with aluminum flour, for 20 minutes. While the pastry is in the freezer, position a rack in the center of the oven and preheat the oven to 400˚F. Without removing the aluminum foil, fill the tart pan with pie weights or dried beans, then bake it for 25 minutes. Remove the pie weights and the foil and continue baking until the pastry is light golden and baked through, 8-10 minutes longer. Let cool completely in the pan on a rack before filling. The verdict? All three dishes were a hit, and so was the dinner party. The carrots are a perfect appetizer and I can imagine having them with all kinds of meals, not just Spanish ones. They reminded us a lot of a phenomenal carrot pickle we had in a Moroccan restaurant in Paris a couple of years back. Suffice to say, we were ecstatic to rediscover those flavors. The Piquillo peppers were a bit involved, but very much worth it. I only had about 10 peppers, but we were only feeding 7, so I just made what I had and saved the remaining veal mixture for some exceptional stuffed bell peppers later in the week. This recipe didn't quite live up to the stuffed Piquillo peppers Esti made back in Germany, but they were a close second. You can be sure that when I receive Esti's recipe I'll be running a comparison--one you can expect to hear about. And finally, it's rare that you find anything other than flan served for dessert in even your finer Spanish restaurants. One of the things that impressed me about Von Bremzen's book--and which got Michelle very excited indeed--was the attention she paid to Spanish sweets. She devotes nearly 60 pages to Spanish desserts of all kinds--including cakes, tarts, custards, ice creams, granitas, and candies--and her selection is sure to utterly change your notion of Spanish dessert-making. 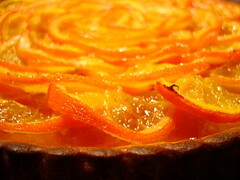 The Valencian Orange Tart made for a perfect closer: tart, sweet, and light on the palate. It's safe to say that Spanish cuisine is very much at the center of the international culinary scene these days. Like so many other cultural arenas, this rebirth started in the years that followed the end of the Franco regime--the rediscovery of cuisine was part of the new freedom, an important part of Spain's modern turn. It began with nouvelle cuisine pioneers like Juan Mari Arzak in the late-1970s and it has continued through to the emergence of Ferran Adrià Superstar and molecular gastronomy in the late-1990s, but as Von Bremzen makes emphatically clear, Spain's culinary boom is made up of both "high" and "low," avant-garde experimentation and authentic regional flavors. The reverberations from this explosion can be felt far and wide. 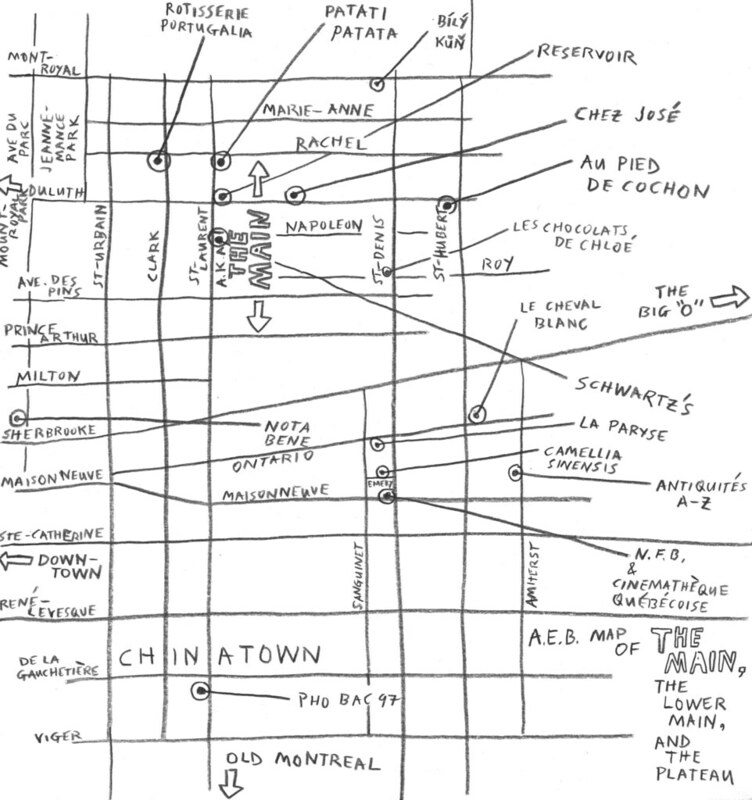 You can feel them in a district of Montreal as far-removed from Spain as Villeray. Then again, with the help of people like Anya von Bremzen, you may just be able to feel them at home. *See Anthony Lane's recent New Yorker article--"High and Low: Flying on the Really Cheap" (April 24, 2006)--on the mysteries of airline travel in the new Europe. 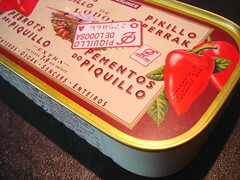 **True, certified Protected Designation of Origin Piquillo peppers are hard to find in Montreal. You can find them at Olives et Épices at Jean-Talon Market though. "Roses are red, violets are..."
It's possible that all little girls are enamoured by flowers, especially the sweet-smelling ones, but I don't know of too many who actually went to the trouble to pretend they were a bee buzzing about gathering nectar. It took a special kind of imagination to pluck a flower and sip the microscopic amount of nectar in the base of the blossom, then pretend to be full after just a few. After all, a bee is a tiny creature, I reckoned. Wouldn't want to take too much. Of all the flowers we had around our place, the lilacs were the most plentiful, along with clover. I never felt any guilt after picking one or two of those flowers. The violets, on the other hand, were never picked. That was the rule. Instead, you had to stoop down low to take in their amazing fragrance. Sometimes I nearly swooned from their heady scent (combined with the head-rush that came from standing up again). No one ever said I wasn't dramatic as a child, maybe even a little melodramatic. Growing up, my mother often talked about fialky the violet-flavoured candies that were sold in Czecholslovakia when she was little. Over the years, I have searched high and low and bought every kind of violet-flavoured candy I managed to find, but none have come close to the fialky she remembers. It's possible that this is because they just don't make them like they used to, or it might be a case that falls under the "it's never as good as you remember" category. Either way, they've been a disappointment. We still give violet-themed gifts to one another whenever we find something new though. I've collected everything from soaps to creams to "linen mists" to chewing gum. With the exception of that ill-conceived last one (there's a reason the Wrigleys stuck to things like Doublemint and Juicy Fruit instead of branching out into florals), they've all been pretty satisfying. The latest find was a violet syrup that was given to me on my birthday. From the start, I knew I had to make something I could share with my mother. I decided to make éclairs. These éclairs were a hit at the dinner party I brought them to. The violets that adorned them came from my mother's garden here in Montreal. I broke our rule because of the special occasion. Preheat oven to 450°F. Bring the water, butter, salt and sugar to a boil. Once it is boiling, add the flour in one shot and stir energetically with a wooden spoon until no flour lumps are visible. Mix until it forms a ball in the pot. Remove from heat. Add the eggs one at a time, mixing hard with your spoon, waiting until the dough comes back together before adding your next egg. Add enough eggs so that a line drawn in the center of the dough falls together slowly at the top. Place dough in a pastry bag with a tip. Prepare a baking sheet with parchment paper or a silpat and pipe either lines for eclairs, or dots for choux. Brush with a beaten egg and bake until they begin to turn golden. Reduce the heat to 350°F and bake until they are uniformly beige in colour. Let cool on a rack. Heat a small amount of creme fraiche in a saucepan, then add the gelatin sheets to dissolve them. Whip the cream to medium stiff peaks. Mix the creme fraiche/gelatin mixture in with the rest of the creme fraiche, fold in the whipped cream, and add the violet syrup to taste. Err on the side of less to avoid alienating the non-flowerlovers. Pour into a pastry bag fitted with a small tip and let set in the frige for a few hours. Pierce the bottoms of the choux pastry with a skewer two or three times, spaced an inch apart. Take the violet cream and insert the tip into each space, piping cream into it until you can see it is full. Repeat until all are full and place in the fridge. Heat the fondant gently in a saucepan, adding violet syrup to help liquify it. Mix until it is shiny and barely warm. Dip each eclair into the fondant "top down" and remove excess with your finger. 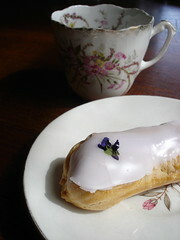 Place a flower on the eclair before the fondant sets. Repeat, and store the eclairs in the fridge until they are served. "Our Dinner With Mario" has turned into several. Seems like every time we open The Babbo Cookbook we find yet another tantalizing dish we'd somehow overlooked before. 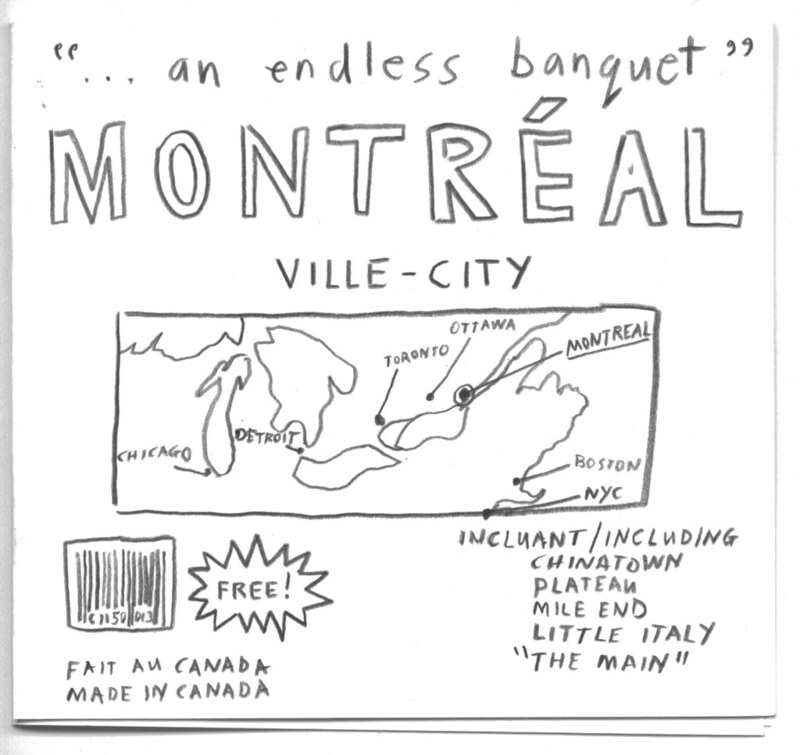 Then that 120 Hours of Bologna spread ("5 days... 62 courses") showed up in the April issue of Gourmet ("Mario's Excellent Adventure" by Bob Sloan). All of the issue's Italy features were great, but the Batali section knocked us out cold. That Lasagne Bolognese alone was enough to make us weep. As a result of all of this, Mr. Batali has been very present in our thoughts for a few months now; not surpisingly this had led to a growing series of Batali-inspired meals. A couple of weeks ago we started looking around for just the right meal to go with a lovely bottle of wine we'd acquired. We're not usually in the position to have truly fine wine, because of our budget we generally stick to the $10 - $20 range, and although you can have consistently good wine within this limited price range, you're never going to come across something sensational, something that expands your mind (beyond the mere effects of the alcohol) the way a really good wine does. 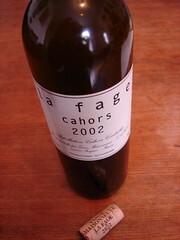 [Again, because of my circumstances, I can count the number of times I've encountered a truly superior wine on one hand. This isn't to say, "Boo-hoo, poor me!" Rather, it is to say, "Let us drink wine!" or, rather, "Bring down the prices! 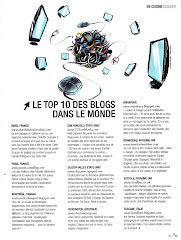 ", especially when they're as grossly inflated as they are in this province. Living in Germany for a year really opened my eyes. There, I was consistently getting wines that go for $20-30 at the Société des Alcools du Québec [SAQ] for €3.99-4.99. Some people have tried to convince me that the exchange rate accounts for this discrepancy. It doesn't. Even if it did, a Coke in a German restaurant often costs €3.00-4.00. Account for that.] Like I said, though, a few weeks ago we had just such a breathtaking bottle of wine, and we were trying to figure out the right way to enjoy it. We'd been told it should absolutely, positively be had with red meat, so we considered our options, tossed around some ideas, then decided we were well overdue for a steak. We could have gone classic (like the filet mignon, sautéed mushrooms, and cauliflower gratin my sister used to favor for her birthday meal back in the day) but then we cracked open that copy of The Babbo Cookbook and the deal was singed, seared, and, uh, well, delivered. Batali's got two ever-so-delicious looking steak recipes in The Babbo Cookbook: a Dry-Rubbed Rib-Eye Steak and a Barbecued Skirt Steak with Endive alla Piastra. We opted for the latter. In a medium casserole (a nonreactive one), combine the herbs, the garlic, and 1/2 cup of the olive oil and stir well. Place the steak in the casserole and turn to coat both sides with the herb mixture. Cover tightly and refrigerate for at least 4 hours (and overnight, if you've planned ahead). Preheat your grill. Remove the steak from the marinade, brush off the excess herb mixture, and season with the salt and pepper. Place the steak on the hottest part of the grill. Cook for 3 minutes on one side, then turn the steak carefully onto the other side and cook for 2 minutes more. While the second side cooks, brush the endive quarters with the remaining 1/4 cup of olive oil, season with salt and pepper, and place on the grill, allowing the endives to get well charred. Remove the steak from the grill and let it rest for 3 minutes. Place 2 tablespoons of salsa verde in the center of each plate. Slice the steak on the bias about 1/2-inch thick and divide the slices evenly among the plates. Serve the grilled endives alongside. In the bowl of a food processor, combine the herbs, capers, anchovies, mustard, salt, sugar, pepper, red pepper flakes, and garlic and pulse to form a coarse puree. Then, with the motor running, slowly drizzle the olive oil into the the bowl until you get a relatively smooth puree. Season with salt and pepper. This salsa will keep for a week in the refrigerator. Note: This recipe makes about 1 1/2 cups of salsa. Much, much more than you need for the skirt steak recipe. You may want to cut it by half or even by a third, unless you think you can actually use 1 1/2 cups of salsa verde in under a week. Very simple, very easy, and just what the doctor ordered. As Batali points out, the skirt steak is already a very flavorful cut of beef. With that 4-hour marinade it was just plain luscious. The salsa verde gave the dish a whole new dimension while teasing out the herbal overtones of the marinade. This was most certainly not just any old steak. Anyway, a couple of weeks later, through another strange twist of fate, we found ourselves in possession of a rather nice, if modest, piece of fresh tuna. Again, we weighed our options then instinctively turned to The Babbo Cookbook. There we found a recipe for Tuna al Tarocco, or Tuna with Blood Oranges, and as it was nearing the end of blood orange season we decided to see out the season with one final bash. In a 12- to 14-inch sauté pan, heat 2 tablespoons of the oil until it reaches the smoking point. Add the sliced mushrooms, red onion, thyme, and salt and pepper and sauté until the mushrooms are crispy, about 5 to 7 minutes. Remove from the heat and set aside. Season the tuna steaks well with salt and pepper. Combine the potato flakes and the crushed peppercorns, moisten one side of the tuna steaks just slightly with water, and then press the moistened side into the potato flake and peppercorn mixture. In a 12- to 14-inch nonstick sauté pan, heat 4 tablespoons of the olive oil over medium-high heat till you reach the smoking point. Sauté the steaks, crust side down, until the crust is crispy, about 3 minutes. Turn the steaks and cook an additional 2 minutes. The steaks that result will be medium rare. While the tuna is cooking, in a separate 12- to 14-inch sauté pan, heat the remaining 2 tablespoons of olive oil until just smoking. Add half the blood orange segments, the mizuna, the sweet garlic cloves, and the radicchio and toss over high heat until the greens are just wilted and warmed through, about 1 minute (no more). 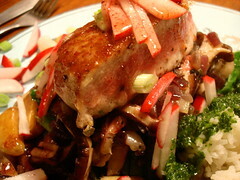 Serve the tuna steaks on top of small mounds of the salad mixture and the shiitake mixture. Garnish with the remaining blood orange segments, the radishes, and the scallions. Drizzle the steaks with the vinaigrette and parsley oil. In a small saucepan, cook the orange juice over high heat until reduced to 1/3 cup, about 5 minutes. Transfer to a bowl and whisk in the mustard and black olive paste until well combined. Whisk in the oil until emulsified. Adjust the seasoning with salt and pepper. Place all of the ingredients in a blender and puree until nearly smooth and uniformly green. Strain through a fine sieve. Note: We made several alterations out of necessity. First off, we only had two tuna steaks (actually one modest tuna steak, which we cut into two even more modest tuna steaks), so we cut the quantities down accordingly. Secondly, we made the blood orange vinaigrette but we eliminated the blood orange segments because the blood oranges at that point were fine for juice but not fit to serve otherwise. Thirdly, we substituted spinach for the mizuna because we find mizuna hard to come by around here. We made one alteration that had nothing to do with necessity. I flat-out flubbed the Parsley Oil, of all things, failing to strain it. Oops. Finally, we weren't sure what to do with the shiitake mixture because Batali's recipe left us high and dry, so we just improvised. Now, you're probably thinking to yourselves, "How could you? Blood orange season is long gone now!!" I know, I know, but the real lessons to be learned from this recipe have nothing to do with blood oranges, they have to do with the mushrooms, the warm salad, and, most importantly, with the potato flakes. We're well acquainted with the cult of panko, but we'd never come across a recipe for an instant-potato-flakes crust. We're glad we did. The crust turned out perfectly and the potato flavor melded with the tuna, the assorted vegetables, and the vinaigrette just beautifully. This was easily the finest seafood meal we'd made for some time. And this time it didn't get overshadowed by no wine. *My grandmother used to refer to flat-leaf parsley as Slovak parsley. In our neighborhood it's known as Portuguese parsley. **As far as I know my grandmother never referred to this as Slovak endive, nor is it known as Portuguese endive in these parts.